The affiliate links used in the post are used to monetize this site. Thank you for supporting my site, by purchasing things you love using these links! It’s that time of year again and if you didn’t already know, I LOVE to host Thanksgiving. It my be my culinary school background, my love for tablescapes or (most likely) the elaborate and gorgeous Thanksgiving memories made up during my childhood years where we would spend the Thanksgiving weekend at my Aunt Susie’s home in San Diego… I’m glad I have fond memories of Thanksgivings growing up and now hosting my own has to be one of the things I most look forward to every year. 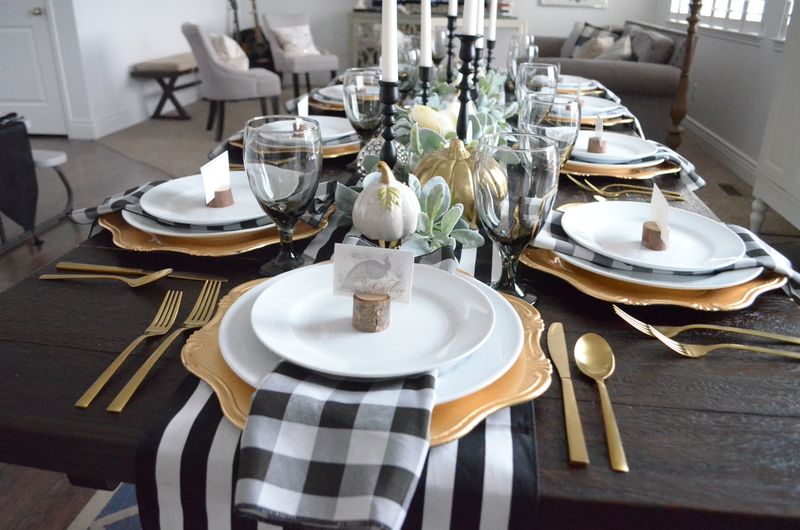 This year I was so in love with the black, white and gold color-scheme that I decided to pull out quite a bit of tableware that I already had on hand like: The gold chargers, the acorns, the gold metal pumpkins, the gold silverware, the black and white buffalo check napkins and the white plates. The centerpiece was made of white cermamic pumkins from the Dollar Tree, the lambsear garland from Hobby Lobby and the white turkey candles from Crate & Barrel (a few years back). I was able to order the black goblets, the stump placecard holders, and this black and white stripped table runner from Amazon , which really tied the centerpiece together. The black candlestick holders are from Target, and came in a three pack. This whole space came together beautifully and I was really happy with how it turned out. As per our tradition I served my buttermilk braised turkey, ham, mashed potatoes, gravy and peas. I tried a new rolls recipe this year, and they were a hit! We also had roasted brussel sprouts and bacon. In addition to my from scratch cranberry, bacon and apple stuffing, I also made creamed corn, homemade cranberry sauce. and my all time favorite, vanilla bean glazed pears…. Holy Yum! Look at everyone digging in! Miss Jade was following in her mama’s footsteps and helped me set and decorate the kids table. Didn’t she do great? It was a lovely day, and this was litterally the best picture I got of all the kiddos. I hope you all had a wonderful Thanksgiving!